One of my favorite things about the blogging world is inspiration from other bloggers DIY projects. Several people reinvent old pieces into something spectacular. Well, unfortunately today I don't have my own DIY projects, but I hope these ideas from Living Etc. inspire a few. I was truly impressed with their before and afters. 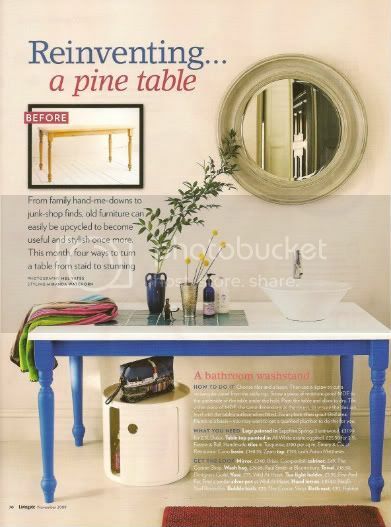 A simple pine table turned into a lovely bathroom washstand, a writing desk, a console and a kitchen table. amazing...I'm not sure how hard it would be to cut out a hole for the tile, but maybe if you had the right tools it wouldn't be too hard? I love this desk, I'm very tempted to paint my black one blue right now! Tangent: I can't get enough of that phone! Being a huge fan of stripes, I think this piece is lovely...especially how it pops in this all white room. Here they've pulled a piece of patterned oilcloth taut across the top and painted the table a bright color. I think it's gorgeous for this space. Does anyone have any upcycling projects going on in their homes right now? What wonderful ideas! I actually really like tables like that. Love the blue in the second photo. What fantastic ideas! Especially love the striped one. 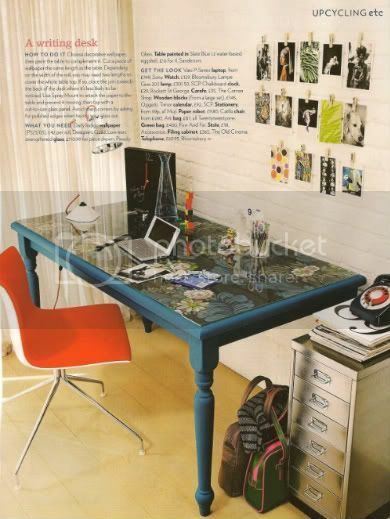 These are so creative- love the blue desk too! It looks like there's wallpaper under a glass top...fab idea! 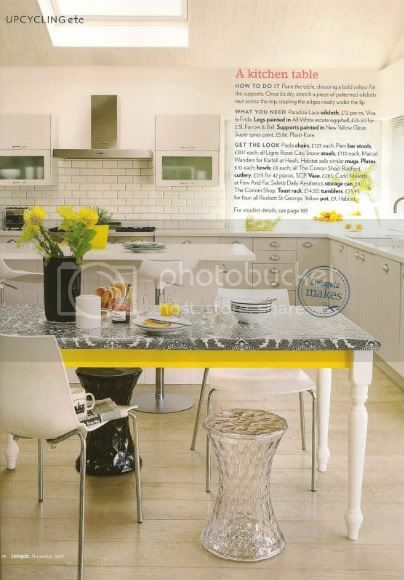 Loving the yellow and gray table but the tile in the first one is genius! great post! carlee1 i love that yellow one the best, it works so beautifully with the grey granite! ALl of these options are awesome! I'm totally digging that peacock blue with the floral paper! I love these! My project is deciding what color to repaint my black dining room chairs. Those images are seriously inspiring! I see those tables on Craigslist every week- it would be a great, cheap project. Such great idea, so creative! Thanks for sharing!! Okay I need to go paint something right now! I am so inspired by these tables! OMG, that kitchen is to die for! How I am longing for a white space with a few bursts of color. Sigh. Love the last photo the best! Makes me wish I had room to refurb a table and make it mine! Great post. Love the idea of reinventing the pine table. The yellow one in kitchen is great.